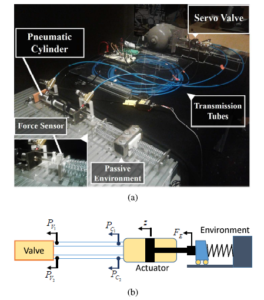 Melih Turkseven and Jun Ueda, Model Based Force Control of Pneumatic Actuators with Long Transmission Lines, IEEE /ASME Transactions on Mechatronics, [LINK Xplore]. Pneumatic systems with long transmission lines have recently gained popularity in tele-operated robotic applications, such as medical robots designed for operations in magnetic resonance (MR) rooms, mobile transportation robots, or pneumatically actuated humanoids. These tele-operated systems typically suffer from time delay and mass flow attenuation between the actuator and the drivers. The conventional paradigm in pneumatic system control is to employ standardized pneumatic system models that present large errors in characterizing the pressure dynamics of tele-operated actuators. The use of more accurate modeling approaches has been limited to flow simulations for their complexity. This study introduces a methodology that adapts an accurate non-linear line model to non-linear controllers. The proposed method utilizes the line model to formulate a virtual input that brings the system to the desired state. The contribution of the proposed method in the force control accuracy was experimentally validated for systems that involve 5 to 10 meter long transmission lines. The introduced method achieved up to 75% reduction in the error compared to a standard sliding-mode based force control at reference frequencies between 0.5 Hz to 2 Hz.